James H. Kitchens, III and John R. Beaman, Jr.
by James H. Kitchens, III and John R. Beaman, Jr.
Media: Soft cover; A4 format; 64 pages of text, black and white photos and full colour profiles by Tom Tullis. Advantages: A true reference book. Comment on all the know photos of all the known aircraft flown by Marseille and all in one book. This is the first in a new series by Air Power Editions of Luftwaffe Knights Cross Holders and their aircraft, 1939-1945. Hans-Joachim Marseille is the subject of the first title in the series, and who better to tell the story but noted historians James H. Kitchens, III and John R. Beaman, Jr? We refer to many books as reference books simply because we can get specific information from them, but most are written for other purposes. This one, however, won't tell you much about Marseille himself, his childhood, family, personality or even much about his exploits in the air other than his score. 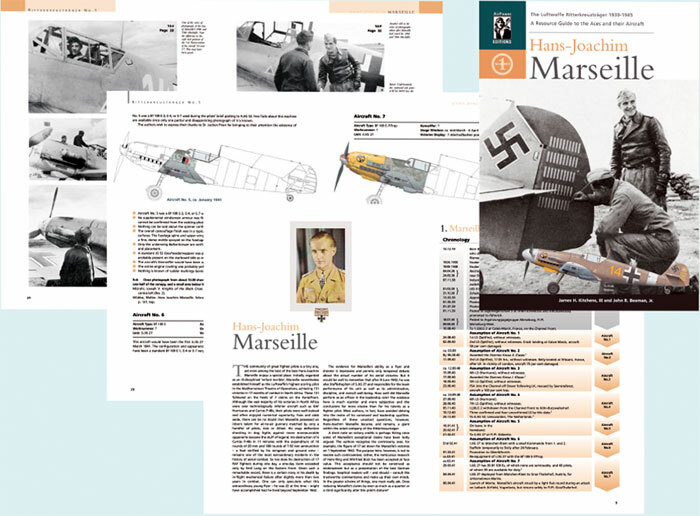 Rather, its intention is to gather all the information on Marseille's known aircraft into one easy to follow title. Along the way, the authors have managed to put paid to much of the misinformation and myth that has grown over time about these aircraft, such as his 109 Fs being standard Trops, not “Z”s as many have claimed. The book begins with a three page Preface by the authors on the purpose of the book. We then have a half page on the man himself followed by a time-line of his career from birth to death, showing all important dates and the 18 identified aircraft. A list of the 18 aircraft follows with all relevant information included plus text under the heading of The Aircraft, General Comments and Observations. This is the beginning of the book proper. Under the headings of Aircraft No 1, 2, etc, each aircraft is examined in depth including its colours and marking if known, successes and failures and dates. Any photos pertaining to this particular aircraft are examined and commented on although they are not necessarily included in the book. The same applies to much of the artwork produced over the years which is rated as to its accuracy. All references are given. Along the way, several aircraft previously thought to have been flown by Marseille, have been shown to be in error and even some mystery aircraft, that is, photos of aircraft associated with him that the authors can not explain are also commented on and in every case again, all references are given. An important element in a book like this is high quality artwork. Who better to supply it than Tom Tullis? Where no information or photos of a particular aircraft is known, no artwork is given. However, where partial information is known, such as some of Marseille’s early “E”s, the artist has made the effort to show the aircraft in a line drawing form with the area known in full colour. Similarly, where an aircraft has only been photographed from one side, as is the case with some of his later aircraft, the artist has shown only that side. It would have been easy for the artist to do a bit of speculation to give a bit more information but that’s not what the book is about. Finally, there is a short piece at the end on what is not known. For instance, there are no known photos of aircraft no 18, the Bf 109 G-2 that Marseille was flying at the time of his death and there are several other gaps in the time line which have yet to be filled. The authors doubt that most of this missing information will ever surface and this is the only piece of speculation in the whole book. For anyone who would like to model one of Marseille's aircraft, or for those who are just interested, this terrific reference book is essential reading. Thanks to Air Power Editions for the review sample.